"Peter Iredale Shipwreck, Fort Stevens, Oregon"
Click image to enlarge Peter Iredale shipwreck, Pacific Ocean, Fort Stevens State Park, Oregon. Sunny, windy, late afternoon. Image taken November 26, 2012. 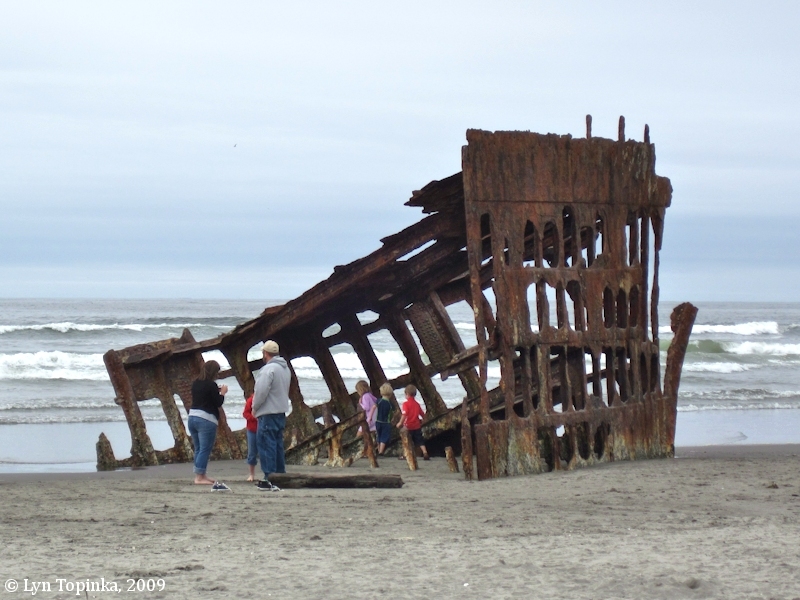 On October 25, 1906, during a heavy southwest wind, the four-masted British vessel, the Peter Iredale, ran aground at Clatsop Beach, off the coast of Fort Stevens. "... The 'Peter Iredale' was a sailing vessel, four-masted steel barque, of 1,993 tons registered tonnage, official number 97790, and built at Maryport, England, in 1890, and belonging to the port of Liverpool, owners P. Iredale & Porter. 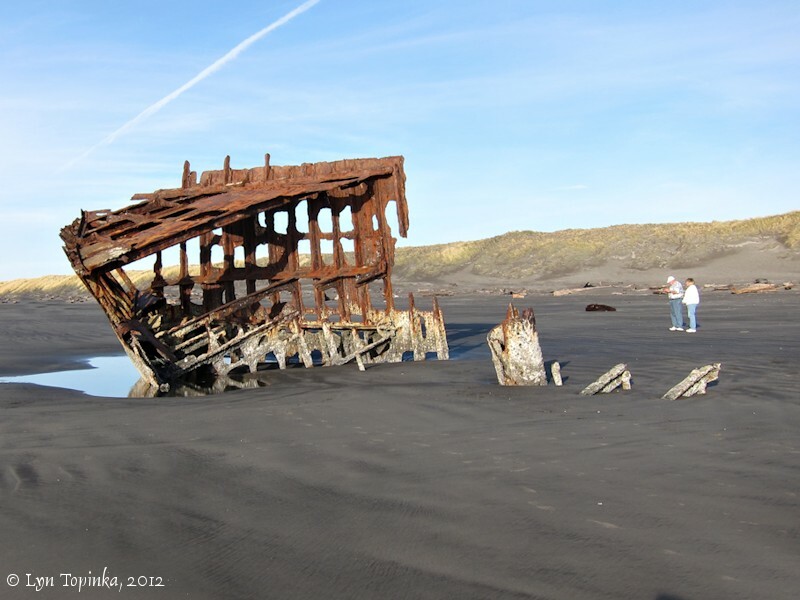 In appears from the evidence given before the Court that the ship sailed from Salina Cruz, Mexico, on or about the 26th of September, 1906, with 1,000 tons of ballast, and a crew of 27 hands all told, including two stowaways. 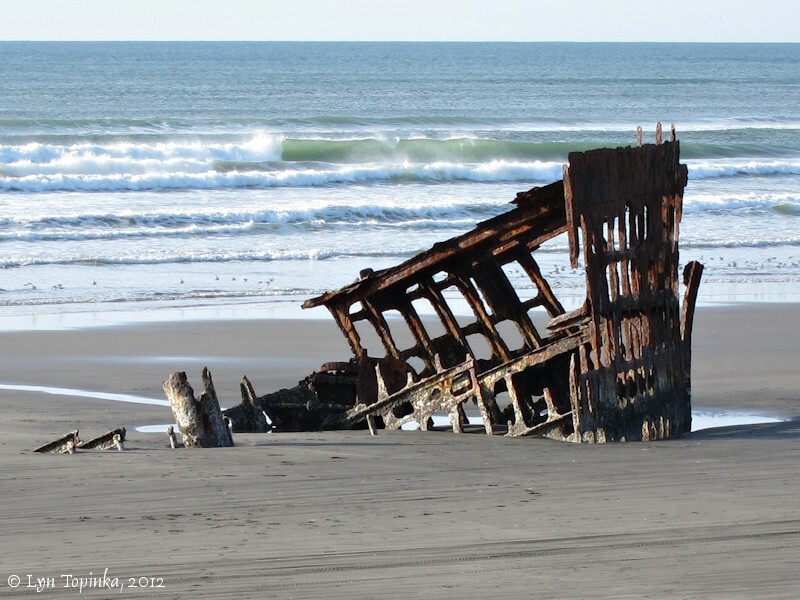 No incident worthy of mention happened until the look-out sighted the light on Tillamook Rock at 3.20 a.m. on the 25th of October, 1906. The ship’s course was altered to E.N.E. until the vessel was five miles off the light. The course was then altered to sight the Columbia River lightship. This was sighted and recognized, it bearing N.E. In this position, finding the wind was veering to westward, and having lost sight of the light in a thick mist, it was decided to wear ship to avoid the influence of the current setting to the north, and the tide running into the Columbia River. The wind had now hauled to north of west in heavy squalls with rain. Just before striking, while in the act of wearing, an exceedingly heavy west north-west squall struck the vessel, throwing her head off, she taking the ground, and shortly afterwards losing her upper spars. She then drove ashore, with a high south-west sea running, and a fresh westerly gale. That the position of the ship before the shift of wind was not one of danger. She was in the usual cruising ground of the pilot schooner, but unfortunately no pilots were on the station, the pilot boat being in port under repairs. We consider that prompt action was taken by the master immediately the wind shifted, to get his ship’s head off shore, and by all accounts he was ably seconded by his officers and men. Having carefully considered the evidence, we do find that the master, and his first and second officers, are in no wise to blame for the stranding of the said vessel, and their certificates having accordingly been returned to them. The Court further desires to put on record their appreciation of the prompt action of the United States life-saving crew at Hammond in having the lifeboat alongside in the heavy surf, and the help given by the captain of the boat when ashore; also of the action of the commander, Col. Walker, U.S.A., and his officers and men, of Fort Stevens for their attention to the wants of the wet and hungry men when at the Fort. And lastly, the Vice-Consul desires to express his satisfaction with the quiet and orderly behaviour of the crew when in Astoria. Given under our hands at the British Vice-Consulate at Astoria, Oregon, on the thirteenth day of November, A.D. 1906. ..."
Source: Transcript courtesy of Historian John Porter, "www.iredale.de" website, 2006. Click image to enlarge Penny Postcard: Peter Iredale wreck, Clastsop Spit, Oregon, 1906. 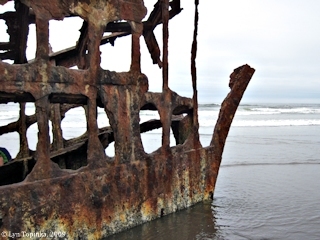 Penny Postcard, 1906, "Peter Iredale Wreck, 1906". In the private collection of Lyn Topinka. The skelton of the Peter Iredale is still visible today, with access to the beach from Fort Stevens. 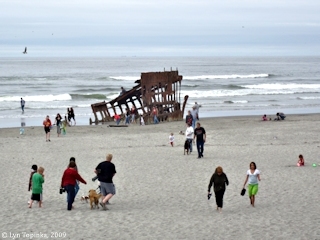 Click image to enlarge Peter Iredale shipwreck, Pacific Ocean, Fort Stevens State Park, Oregon. Weather overcast and grey, but surprisingly no rain. Image taken August 8, 2009.